The university is a member of the International Alliance of Research Universities (IARU), along with University of Cambridge, Yale University, The Australian National University, and UC Berkeley, amongst others, and of the League of European Research Universities (LERU). The 2016 Academic Ranking of World Universities ranks the University of Copenhagen as the best university in Scandinavia and 30th in the world, the 2016-2017 Times Higher Education World University Rankings as 120th in the world, and the 2016-2017 QS World University Rankings as 68th in the world. As of October 2018, the university has had 39 Nobel laureates affiliated as alumni, faculty members and researchers, and has produced one Turing Award recipient. The university is governed by a board consisting of 11 members: 6 members recruited outside the university form the majority of the board, 2 members are appointed by the scientific staff, 1 member is appointed by the administrative staff, and 2 members are appointed by the university students. The rector, the prorector and the director of the university are appointed by the university board. The rector in turn appoints directors of the different parts of the central administration and deans of the different faculties. The deans appoint heads of 50 departments. There is no faculty senate and faculty is not involved in the appointment of rector, deans, or department heads. Hence the university has no faculty governance, although there are elected Academic Boards at faculty level who advise the deans. The governing body manages an annual budget of about BDKK 8.3. The University is organized into six faculties and about 100 departments and research centres. The University employs about 5,600 academic staff and 4,400 technical and administrative staff. The total number of enrolled students is about 40,000, including about 23,000 undergraduate students and 17,000 graduate students. UCPH has established an international graduate talent program which provides grants for international Ph. D, students and a tenure track carrier system. UCPH operates about fifty master’s programmes taught in English, and has arranged about 150 exchange agreements with other institutions and 800 Erasmus agreements. Each year there are about 1,700 incoming exchange students, 2,000 outbound exchange students and 4,000 international degree-seeking students. About 3,000 PhD students study there each year. North Campus – home to most of the Faculty of Science and the Faculty of Health and Medical Sciences. City Campus – home to the Faculty of Social Sciences and Central Administration as well as parts of the Faculty of Health and Medical Sciences and the Faculty of Science. South Campus – houses the Faculty of Humanities, the Faculty of Law, the Faculty of Theology, and a small proportion of the Faculty of Science. Frederiksberg Campus – home to sections of the Faculty of Science and the Faculty of Health and Medical Sciences. The Faculty of Health and Medical Sciences and the Faculty of Science also use the Taastrup Campus, which is located in Taastrup on the western outskirts of Copenhagen. The Faculty of Science also has facilities in Helsingør, Hørsholm and Nødebo. The Rundetårn (round tower) was used in the 17th century as an observatory by Ole Rømer. The university was closed by the Church in 1531 to stop the spread of Protestantism, and re-established in 1537 by King Christian III after the Lutheran Reformation and transformed into an evangelical-Lutheran seminary. Between 1675 and 1788, the university introduced the concept of degree examinations. An examination for theology was added in 1675, followed by law in 1736. By 1788, all faculties required an examination before they would issue a degree. In 1807, the British fleet bombarded Copenhagen during the Bombardment of Copenhagen, destroying most of the university's buildings. By 1836, however, the new main building of the university was inaugurated amid extensive building that continued until the end of the century. The University Library (now a part of the Royal Library), the Zoological Museum, the Geological Museum, the Botanic Garden with greenhouses, and the Technical College were also established during this period. Between 1842 and 1850, the faculties at the university were restructured. Starting in 1842, the University Faculty of Medicine and the Academy of Surgeons merged to form the Faculty of Medical Science, while in 1848 the Faculty of Law was reorganised and became the Faculty of Jurisprudence and Political Science. In 1850, the Faculty of Mathematics and Science was separated from the Faculty of Philosophy. In 1845 and 1862 Copenhagen co-hosted nordic student meetings with Lund University. The new university statute instituted in 1970 involved democratisation of the management of the university. It was modified in 1973 and subsequently applied to all higher education institutions in Denmark. The democratisation was later reversed with the 2003 university reforms. Further change in the structure of the university from 1990 to 1993 made a Bachelor's degree programme mandatory in virtually all subjects. Also in 1993, the law departments broke off from the Faculty of Social Sciences to form a separate Faculty of Law. In 1994, the University of Copenhagen designated environmental studies, north-south relations, and biotechnology as areas of special priority according to its new long-term plan. Starting in 1996 and continuing to the present, the university planned new buildings, including for the University of Copenhagen Faculty of Humanities at Amager (Ørestaden), along with a Biotechnology Centre. By 1999, the student population had grown to exceed 35,000, resulting in the university appointing additional professors and other personnel. In 2003, the revised Danish university law removed faculty, staff and students from the university decision process, creating a top-down control structure that has been described as absolute monarchy, since leaders are granted extensive powers while being appointed exclusively by higher levels in the organization. In 2005, the Center for Health and Society (Center for Sundhed og Samfund – CSS) opened in central Copenhagen, housing the Faculty of Social Sciences and Institute of Public Health, which until then had been located in various places throughout the city. In May 2006, the university announced further plans to leave many of its old buildings in the inner city of Copenhagen, an area that has been home to the university for more than 500 years. The purpose of this has been to gather the university's many departments and faculties on three larger campuses in order to create a bigger, more concentrated and modern student environment with better teaching facilities, as well as to save money on rent and maintenance of the old buildings. The concentration of facilities on larger campuses also allows for more inter-disciplinary cooperation; for example, the Departments of Political Science and Sociology are now located in the same facilities at CSS and can pool resources more easily. In January 2007, the University of Copenhagen merged with the Royal Veterinary and Agricultural University and the Danish University of Pharmaceutical Science. The two universities were converted into faculties under the University of Copenhagen, and were renamed as the Faculty of Life Sciences and the Faculty of Pharmaceutical Sciences. In January 2012, the Faculty of Pharmaceutical Sciences and the veterinary third of the Faculty of Life Sciences merged with the Faculty of Health Sciences forming the Faculty of Health and Medical Sciences – and the other two thirds of the Faculty of Life Sciences were merged into the Faculty of Science. Although many privately owned dormitories (kollegier in Danish) exist in Copenhagen, there are also five which are partially administered by the university. Only students who have passed at least two years of studies are considered for admission. These are normally referred to as the old dormitories, and they consist of Regensen, Elers' Kollegium, Borchs Kollegium, Hassagers Kollegium, and Valkendorfs Kollegium. Contrary to the tradition of most American dormitories, Danish dormitories in general, and the old dormitories in particular, only offer single rooms for rent, meaning no student has to share their room with others. The University of Copenhagen Housing Foundation is a separate commercial entity which provides housing for the University's international students and guest researchers. (i.e. Seal of the University of Copenhagen, reestablished by King Christian III). In addition to the university seal, each of the university's six faculties carry seals of their own. The 2018 Academic Ranking of World Universities published by Shanghai Jiao Tong University ranks the University of Copenhagen as the best university in Denmark and Scandinavia, the 6th best university in Europe, and 29th in the Top 500 World Universities ranking. In the Times Higher Education World University Rankings for 2016-2017, the University of Copenhagen is ranked is ranked second in Denmark (behind Aarhus University) and at 120th overall in the world. In the 2016-2017 QS World University Rankings list, the University of Copenhagen was ranked 68th. In the 2017 U.S. News & World Report's Best Global Universities Rankings list, the University of Copenhagen was ranked 49th. The university cooperates with universities around the world. In January 2006, the University of Copenhagen entered into a partnership of ten top universities, along with the Australian National University, ETH Zürich, National University of Singapore, Peking University, University of California Berkeley, University of Cambridge, University of Oxford, University of Tokyo and Yale University. The partnership is referred to as the International Alliance of Research Universities (IARU). The Department of Scandinavian Studies and Linguistics at University of Copenhagen signed a cooperation agreement with the Danish Royal School of Library and Information Science in 2009. Henrik Caspar Wegener (2017 – current rector). He is the 259th rector. The oldest surviving lecture plan from the university is from 1537. Tycho Brahe (1546–1601), Danish astronomer, first scientific documentation of supernovas, mentor of Johannes Kepler. Thomas Fincke (1561–1656), Danish mathematician and physicist. Caspar Bartholin (1585–1629), professor in medicine and theology. Author of textbooks on anatomy and the discoverer of the workings of the olfactory nerve. Olaus Wormius (1588–1655), Danish physician and antiquarian. Thomas Bartholin (1616–1680), discoverer of the lymphatic system. Rasmus Bartholin (1625–1698), professor in geometry and medicine. Discovered birefringence, but was unable to give a scientific explanation. Thomas Hansen Kingo (1634–1703), Danish bishop and poet. Nicholas Steno (1638–1696), a pioneer in anatomy and geology. Ole Rømer (1644–1710), Danish astronomer, made the first quantitative measurements of the speed of light. Peder Horrebow (1679–1764), Danish astronomer and member of Académie des Sciences. Ludvig Holberg (1684–1754), Danish-Norwegian writer and playwright. Morten Thrane Brunnich (1737–1827), Danish zoologist. Hans Christian Ørsted (1777–1851), Danish physicist and chemist, discovered electromagnetism. Anders Sandøe Ørsted (1778–1860), Danish lawyer and prime minister of Denmark (1853–1854). Adam Gottlob Oehlenschläger (1779–1850), poet, author of lyrics of the Danish national anthem Der er et yndigt land. N. F. S. Grundtvig (1783–1872), Danish writer, poet, philosopher and priest. Christopher Hansteen (1784–1873), Norwegian astronomer and physicist. Johan Ludvig Heiberg (1791–1860), Danish poet and critic. Magnús Eiríksson (1806–1881), Icelandic theologian. Søren Kierkegaard (1813–1855), Danish theologian and philosopher, the father of existentialism. Anders Sandøe Ørsted (1816–1872), professor of botany 1851–1862. Hinrich Johannes Rink (1819–1893), Danish geologist, and founder of the first Greenlandic language newspaper. Peter Ludvig Panum (1820–1885), Danish physiologist and pathologist, the Panum Building in Copenhagen is named in his honor. Hans Schjellerup (1827–1887), Danish astronomer. Carl Lange (1834–1900), Danish physician. Thorvald N. Thiele (1838–1910), Danish astronomer, actuary and mathematician. Julius Petersen (1839–1910), Danish mathematician. Eugenius Warming (1841–1924), Danish botanist and founding figure of ecology. Georg Brandes (1842–1927), Danish writer and critic. Vilhelm Thomsen (1842–1927), Danish linguist. Harald Høffding (1843–1931), Danish philosopher theologian psychologist. Hans Christian Gram (1853–1938), Danish bacteriologist, inventor of Gram staining. Christian Bohr (1855–1911), Danish physician who described Bohr effect. Wilhelm Johannsen (1857–1927), Danish botanist, first coined the word gene in its modern usage. Niels Ryberg Finsen (1860–1904), Nobel laureate in medicine (1903). Otto Jespersen (1860–1943), Danish linguist, co-founder of the International Phonetic Association. Kirstine Meyer (1861–1941), Danish physicist. Hannes Hafstein (1861–1922), Icelandic politician and poet. Johannes Andreas Grib Fibiger (1867–1928), Nobel laureate in medicine (1926). Holger Pedersen (1867–1953), Danish linguist. S. P. L. Sørensen (1868–1939), Danish chemist who introduced the concept of pH. Martin Knudsen (1871–1949), Danish physicist. August Krogh (1874–1949), Nobel laureate in medicine (1920). Holger Scheuermann (1877–1960), Danish surgeon after whom Scheuermann's disease is named. Kirstine Smith (1878–1939), Danish statistician credited with creation of optimal design of experiments. Benjamin Christensen (1879–1959), Danish film director, screenwriter and actor. 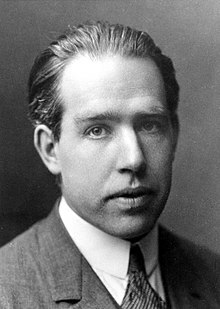 Niels Bohr (1885–1962), contributed to development of the atomic model and quantum mechanics. Director at the university's Institute of Theoretical Physics. Nobel laureate in physics (1922). Øjvind Winge (1886–1964), Danish biologist. Harald Bohr (1887–1951), Danish Olympic silver medalist football player and mathematician; brother of Niels Bohr. Inge Lehmann (1888–1993), Danish seismologist discovering the Earth's inner core. Jakob Nielsen (1890–1959), Danish mathematician. Julie Vinter Hansen (1890–1960), Danish astronomer. Oskar Klein (1894–1977), Swedish theoretical physicist. Henrik Dam (1895–1976), Nobel laureate in medicine (1943). Sir Ove Arup (1896–1988), Anglo-Danish structural engineer. Alf Ross (1899–1979), Danish legal philosopher. Louis Hjelmslev (1899–1965), Danish linguist, founder of Copenhagen School. Georg Rasch (1901–1980), Danish mathematician, statistician, and psychometrician. Knud Ejler Løgstrup (1905–1981), Danish philosopher and theologian. Pastor at Sandager-Holevad 1936–1943. Professor at University of Aarhus 1943–1975. 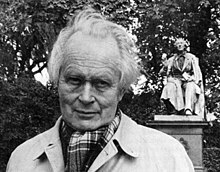 Piet Hein (1905–1996), Danish mathematician, inventor and poet. Bengt Strömgren (1908–1987), Danish astronomer and astrophysicist. Hilde Levi (1909–2003), German-Danish physicist. Niels Kaj Jerne (1911–1994), Nobel laureate in medicine (1984). Preben von Magnus (1912-1973), Danish virologist who gave name to the Von Magnus phenomenon. Jens Otto Krag (1914–1978), prime minister of Denmark (1962–1968, 1971–1972). Poul Hartling (1914–2000), prime minister of Denmark (1973–1975) and United Nations High Commissioner for Refugees (1978-1985), Nobel Peace Prize laureate on behalf of UNHCR(1981). Poul Bjørndahl Astrup (1915-2000), Danish clinical chemist, inventor of blood gas analyzer. Jens Christian Skou (born 1918), Nobel laureate in chemistry (1997) for his discovery of Na+,K+-ATPase. Hans H. Ørberg (1920–2010), linguist and scholar. Aage Bohr (1922–2009), professor in nuclear physics and director of the Niels Bohr Institute at the university. Nobel laureate in physics (1975). Halfdan T. Mahler (born 1923), Director-General of World Health Organization(1973–1988). Ben Roy Mottelson (born 1926), American-born Danish nuclear physicist, Nobel laureate in physics (1975). Peter Naur (1928-2016), computer scientist, Turing Award in 2005. Poul Schlüter (born 1929), prime minister of Denmark (1982–1993). Vigdís Finnbogadóttir (born 1930), the 4th President of Iceland (1980–1996). Jørgen Rischel (1934–2007), Danish linguist who analyzed Greenlandic and Mon-Khmer languages. Per Kirkeby (born 1938), Danish painter and sculptor. Per Pinstrup-Andersen (born 1939), Danish economist, 2001 World Food Prize laureate. Søren Johansen (born 1939), Danish econometrician. Lasse Hessel (born 1940), inventor of female condom. Anders Boserup (1940 – 1990), co-founder of the Danish Institute for Peace and Conflict Research and the Nordic Peace Foundation. Aage B. Sørensen (1941–2001), Danish sociologist. Holger Bech Nielsen (born 1941), Danish physicist, one of three creators of string theory. Jørgen Haugan (born 1941), Doctorate in Philosophy (1977); Norwegian author and lecturer. Poul Nyrup Rasmussen (born 1943), prime minister of Denmark (1993–2001). Niels Peter Lemche (born 1945), biblical scholar, founder of Copenhagen School. Mogens Lykketoft (born 1946), Danish politician, the 70th President of the United Nations General Assembly(2015-2016). Halldór Ásgrímsson (born 1947), prime minister of Iceland (2004–2006). Uffe Haagerup (born 1949), Danish mathematician. Peter Høeg (born 1957), Danish fiction writer, won international acclaim with Smilla's Sense of Snow. Morten Frost (born 1958), Danish world-class badminton player and coach. Mads Tofte (born 1959), computer scientist, vice chancellor of IT University of Copenhagen. Ole Wæver (born 1960), scholar of International Relations, one of exponents of Copenhagen School. Steve Scully (born 1960), American host, senior producer, and political editor of the C-SPAN network's Washington Journal studied at the University of Copenhagen as part of his master's program at Northwestern University in Evanston, Illinois. Corinna Cortes (born 1961), computer scientist. Lars Løkke Rasmussen (born 1964), prime minister of Denmark (2009–2011, 2015–present). Lars Mikkelsen (born 1964), Danish actor. Bjørn Lomborg (born 1965), Danish economist, author of The Skeptical Environmentalist. Helle Thorning-Schmidt (born 1966), prime minister of Denmark (2011–2015). Eskild Ebbesen (born 1972), Danish world-class lightweight rower. Høgni Reistrup (born 1984), MA in Media Studies 2010 from the University of Copenhagen, co-writer of the book Exit Føroyar which created much debate in Denmark and the Faroe Islands about the decreasing population in the Faroe Islands. ^ "Facts and figures – University of Copenhagen". University of Copenhagen. Archived from the original on 4 February 2009. Retrieved 16 January 2015. ^ a b "Personale" [Personnel] (in Danish). University of Copenhagen. Retrieved 16 January 2015. ^ a b c "Studerende" [Students]. University of Copenhagen. Retrieved 1 October 2017. ^ "Forskning og formidling" [Research and circulation] (in Danish). University of Copenhagen. Retrieved 16 January 2015. ^ a b "Academic Ranking of World Universities". Shanghairanking.com. Retrieved 23 September 2016. ^ a b "World University Rankings". Times Higher Education. Retrieved 23 September 2016. ^ a b "QS World University Rankings". QS Quacquarelli Symonds Ltd. Retrieved 23 September 2016. ^ "Peter Naur - A.M. Turing Award Winner". Retrieved 27 October 2016. ^ "Vedtægt for Københavns Universitet". Retrieved 2009-11-08. ^ a b c "Map and campus areas". University of Copenhagen. Archived from the original on 6 June 2014. Retrieved 28 January 2016. ^ Gilman, Daniel Coit; Peck, Harry Thurston; Colby, Frank Moore (1905). The new international encyclopaedia. Dodd, Mead. ^ "Absolut monarki på universiteterne". 23 August 2009. Retrieved 2009-11-20. ^ "Search CVR". Data. Retrieved 2017-01-10. ^ "The University of Copenhagen Housing Foundation". housingfoundation.ku.dk. 2013-11-13. Retrieved 2017-01-10. ^ "Best Global Universities Rankings". U.S. News & World Report. Retrieved 28 October 2016. ^ "Det Informationsvidenskabelige Akademi – Københavns Universitet". University of Copenhagen. Archived from the original on 27 July 2011. Retrieved 16 January 2015. ^ "Det Informationsvidenskabelige Akademi – Københavns Universitet". University of Copenhagen. Archived from the original on 17 October 2011. Retrieved 16 January 2015. ^ "Rector – University of Copenhagen". University of Copenhagen. Archived from the original on 3 January 2017. Retrieved 18 March 2017. ^ "Congress and the Presidency in the TV and Digital Age" (PDF). C-SPAN. Retrieved May 4, 2011. ^ "Høgni Reistrup". LinkedIn. Retrieved 17 January 2016. ^ Bohlbro, Peter (13 March 2013). "Folketingets Færøudvalg holder temamøde om den voksende fraflytning fra Færøerne" (in Danish). The Folketing. Retrieved 17 January 2016. ^ "Denmark". Directory of Open Access Repositories. UK: University of Nottingham. Retrieved 11 March 2018. Wikimedia Commons has media related to University of Copenhagen.